This Sunday (May 29th) Parkdale Village BIA will be hosting a Parkdale Village Ornamental Gardens Clean Up Day! Meet in front of the Green P Parking Lot garden plots (1315 Queen Street West, beside the Dollarama) at 11:00 am to lend a hand with prepping our community’s gardens for this growing season! All seven plots in Parkdale Village will be weeded, tidied, and prepped for the planting happening within them in the very new future. We’d love to have you out, and look forward to hearing your suggestions and ideas of how the Parkdale Gardens should and can grow! There will be some gardening tools; you are more than welcome to bring your own. Please provide your own gardening gloves if you have them! This event will happen RAIN OR SHINE. Please contact Marcus McLean at festival@parkdalevillagebia.com if you have any questions or comments! We’d love to hear from you, and hope to see you this Sunday! In celebration of Bike Month, the High Park Library will be hosting a Free BIKES & BOOKS event in partnership with the Toronto Cyclists Union on Saturday June 4, 2011 (see attached flyer). Learn about basic bicycle maintenance, safety, security. Check out a display of books & magazines about biking. The class will take place from 11:30 am to 1:30 pm, the drop-in clinic from 1:30 to 3:30 pm. Free and open to all – no registration required! Please see Radio Parkdale press release for more information. In order to avoid having clients’ cheques delayed by a potential postal disruption, the City of Toronto’s Employment and Social Services division will not be mailing its June 2011 Ontario Works cheques. These arrangements are in effect whether or not an agreement is reached over the coming days by Canada Post and the Canadian Union of Postal Workers (CUPW). A to K cheque pickup date: Monday, May 30 from 8 a.m. to 6 p.m.
L to Z cheque pickup date: Tuesday, May 31 from 8 a.m. to 6 p.m. Appropriate identification is required in order to pick up a cheque. Examples of appropriate identification are a birth certificate, driver’s licence, passport or immigration documents. Clients who are unable to pick up their cheque on the above dates can call their caseworker. Clients who normally receive their payments by direct bank deposit will not be affected. The May 2011 Drug Benefit Card has been extended to cover clients during this period. For more information, clients can call their caseworkers, or for a complete list of office locations, visit http://www.toronto.ca/socialservices. If a postal disruption is to occur, further information about other City divisions that may be affected will be made available on the City’s website at http://www.toronto.ca. Councillor Ana BailÃ£o and City Planning are conducting a local area study along the rail corridor in Ward 18. The study will focus on the following. The transportation network including pedestrian and bicycle routes and connections to the West Toronto Rail Path. An inventory of existing parks and open spaces, those needing upgrading and possible locations for new parks. The existing and needed community facilities. Identifying incentives to encourage employment uses. A review of the school sites. The study will not be looking at land use in the study area as this is being reviewed as part of the Municipal Comprehensive Review that the city is currently undertaking of all the Employment Lands in the City. All Meetings and Walks start at 6:30 p.m.
As part of the Minister of Environment’s October 2009 approval of the GTS project, Metrolinx committed to completing additional air quality modeling and human health assessments. Metrolinx’s previous air quality and human health assessments were based on Tier 2 emission standards for locomotive engines (current standard). The new assessment uses Tier 4 emissions standards (upcoming standard) that will be implemented by the ARL and GO fleet. Metrolinx was also asked to draft a revised human health mitigation plan to address possible health risks, if any, after the move to Tier 4-compliant locomotives. 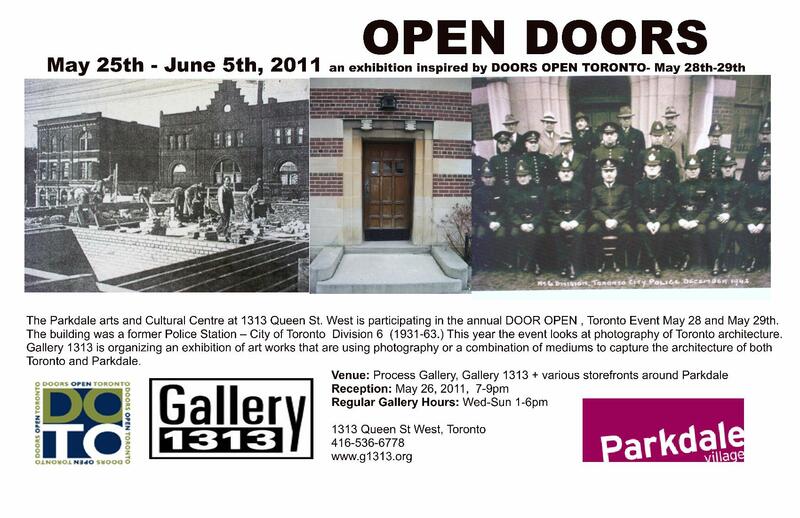 Tuesday June 14, 2011 6:30 – 8:30 p.m. Harbourfront Community Centre, 627 Queens Quay W.
Thursday, June 16, 2011 6:30 – 8:30 p.m. Lithuanian House, 1573 Bloor Street W.
The City of Toronto in conjunction with Direct Engagement will hold a town hall meeting as part of work to develop a long-term community strategy on graffiti. Participants can attend the town hall either in person or through live streaming. This town hall will take place on Tuesday May 31st, 2011 from 7:00 to 9:00 p.m. at the Drake Hotel, 1150 Queen Street West, Toronto, ON. The theme is developing a ‘community strategy’ on graffiti. The first part of the Town Hall will have seven speakers that include a curator from the AGO; a graffiti artist; small business owner; and various community organizations that will give their perspective on the graffiti issue in the City. The second part of the event will be an interactive panel discussion that will include a small business representative; a street artist; Jeff Melanson, Special Advisor on the Arts to Mayor Rob Ford; and City Councillor Michael Thompson. Media interviewers from the National Post, CanadaOne and The Globe & Mail as well as members of the audience will be able to pose questions to the panel in person or online via the live web-cast. Council Highlights provides informal summaries of some of the decisions made by Toronto City Council at its business meetings. The City Clerk’s Office provides full and authoritative documentation of all of Council’s business and decisions, available online at http://www.toronto.ca/council. Council supported proceeding with initiatives that may lead to the contracting out of some of the garbage and recycling collection services now provided by City of Toronto employees. As a result, the City will invite bids on contracts for daytime residential curbside collection west of Yonge Street to the Etobicoke border, litter and recycling collection in City parks, and litter vacuuming services. Several related motions were adopted, such as one specifying that Council as a whole will oversee the bid process, one to ensure that the City’s waste diversion standards/targets are upheld, and a motion concerning City staff who may be affected by the contracted services. Council voted to dissolve all but four of its advisory committees – those being the Aboriginal Affairs Committee; the Film, Television and Commercial Production Industry Committee (formerly the Toronto Film Board); the Disability Issues Committee; and the Community Partnership and Investment Program Appeals Committee. Several motions by members of Council regarding the establishment of new committees or the re-establishment of former committees were referred to the Mayor for further consideration and for a report back to Council in June. City Councils establish advisory bodies and working committees to support decision-making. They are dissolved at the end of each term, apart from those required by legislation. The recommendations presented in the “Creative Capital Gains: An Action Plan for Toronto” report received Council’s endorsement. The report – produced by a Creative Capital Initiative that involved input from Toronto’s cultural and business leaders, and extensive outreach – identifies areas for City investment and specifies actions to pursue. The next step is the preparation of an implementation plan supporting cultural activity as a catalyst for economic growth. Council repealed the city-wide zoning bylaw that was put in place last year to replace the numerous and complex zoning regulations the City inherited from the municipalities that amalgamated in 1997. Council wants the harmonized bylaw – a document of several thousand pages – revised to address some content that has prompted complaints and appeals. Council directed the City Manager to prepare a report on a procedure that would enable Toronto residents who live on streets with posted speed limits of no more than 40 kilometres an hour to apply for an exemption from the current city bylaws that prohibit playing ball hockey and other ball sports on any city street. Council decided against a recommendation to install new incinerators at the City’s Highland Creek plant for disposal of biosolids (sewage sludge) resulting from sewage treatment. Instead, Council favoured pursuit of a “beneficial use” disposal strategy, which involves spreading biosolids on fields as fertilizer. In a separate decision, Council voted in favour of upgrading the Ashbridges Bay Treatment Plant to use an ultraviolet light (UV) system for the disinfection of secondary effluent streams of treated wastewater before it flows from the plant into Lake Ontario. Council rescinded a mandatory TTC Metropass program for new condominiums in designated growth areas of Toronto that took effect last year, and directed staff to provide information to developers about the TTC’s discount pass program. Where a Metropass has already been included in a unit’s purchase price, the City will ensure that buyers are refunded or receive their transit passes. Council agreed to amend the Municipal Code to introduce 24-hour and 48-hour permits for temporary parking on residential streets. The fee will be $8 for a 24-hour parking permit and $12 for a 48-hour permit, subject to annual inflationary increases indicated by the Consumer Price Index. The program will give people online access to the temporary permits any time – “24/7”. Council adopted a recommendation to lift a moratorium that prohibited filming at several addresses that were the subject of neighbourhood complaints. Renting out university fraternity houses downtown for filming is a source of revenue for the owners, helping them cover the costs of maintaining their properties, while access to the buildings supports Toronto’s film industry. Council decided to allow arrangements for filming at fraternity houses as long as those involved abide by City bylaws and do not disrupt the surrounding community. Council authorized future uses of Old City Hall at Queen and Bay streets – including leasing it for commercial, institutional and government purposes – when the current lease with the provincial courts expires at the end of 2016. The courtyard area is to be reserved for the Toronto Museum Project, with provision of a public space in the building for access to the courtyard area. I am happy to report some important City-wide and local successes from the last week or so. At City Council, two environmental goals I have been working on for quite some time were met: Council voted to phase out the incineration of sewage sludge at the highland creek incinerator. We also voted to stop treating sewer discharges to Lake Ontario with chlorine, and to use UV light to kill bacteria instead. Both of these victories came despite Mayor Ford’s opposition. In addition, the Mayor’s plan to eliminate Citizen Advisory Committees will go through a further review despite his plan to eliminate them outright. In local news, the Roncesvalles reconstruction work is still on schedule for completion this summer. Thanks to the many volunteers who came out last weekend to plant trees on the western side of Roncesvalles. Thanks also to the many of you who have told me how much you like the look of the new streetscape. Another piece of good news is we now have a commitment from City staff that the new pedestrian crossing to the lakeshore at Dowling will be completed this fall. It’s taken a long time but, public access to the waterfront is improving. We all need to speak up now to protect the services we depend on to keep Toronto strong and healthy. It’s farmers market season and folks in the joint Ward 13 and 14 High Park Residents Association are looking for your thoughts on a future Ward 13 Farmers Market. This Ward 13 farmers market would be a welcome addition to the farmers market currently taking place in Ward 14, on Mondays, 3 – 7 pm, at Sorauren Park. One of the city’s most popular annual events, provides free access to buildings of architectural, historic, social and cultural significance to a diverse, all-ages audience. Launched in May 2000 by the City of Toronto, this award-winning event has attracted over 1.9 million visitors. 25 RITCHIE at 25 Ritchie Street- NEW! 36 Chambers (Formerly Ushers Grocery Store) at 1266 Queen St West-NEW! For more details, visit www.toronto.ca/doorsopen/buildings.htm. Most buildings are open from 10 a.m. – 5 p.m. both days, but some hours vary. There will be a free launch event at the Royal Ontario Museum on Friday May 27th from 4:30-8:30 p.m. The museum opens its doors to the public for free (excluding its ticketed event “Water: The Exhibition”). At 6:30 p.m. Dean Goodman of Levitt Goodman Architects , hosts three notable architectural photographers (Peter MacCallum. Peter A. Sellar and Cindy BlaÅ¾evic ) who will speak about their work in the ROM Lecture Theatre to kick off the 2011 Doors Open Toronto photography theme. Roncesvalles Renewed has begun planting! After two years of construction, new trees were planted on Roncesvalles on Saturday May 14th. Every new tree on Roncesvalles is being planted in conditions where it will thrive and flourish for generations to come. Together with the existing trees, new trees will form a beautiful shade canopy. On the west side, where most of the properties are privately owned by individuals or institutions, the City contributed free trees where conditions are suitable and owner willing to accept one. On the east side, the planting beds are being readied. Planting will take place from May to June 2011.
working together to optimize efforts for the planned reconstruction of Roncesvalles Avenue. The City of Toronto. Call 311 and ask for a tree from Urban Forestry. Every tree in our neighbourhood helps green the whole community. Hydro One is initiating a Class Environmental Assessment (EA) to replace parts of the existing high-voltage electricity infrastructure serving the western Lakeshore area of the City of Toronto, a distance of 5.6 kilometers. In order to ensure that Toronto Hydro customers continue to receive a safe and reliable supply of electricity, Hydro One proposes to replace two of the existing 115 kilovolt (kV) underground transmission cables in their existing location with 230 kV cables. The cables connect Strachan Transformer Station (TS) located on the CNE grounds at Strachan Avenue and Manitoba Drive, and Riverside Junction (Jct) located at the Queensway and Windermere Ave. and were originally installed in the late 1950s. The cables are nearing their end of life and require replacement as identified in Hydro One’s regular asset sustainment program. Pending all the necessary approvals and permits, construction is expected to begin in early 2011 with the new facilities in service by December 2012. As part of the Class EA process, they will be consulting local residents, businesses and other stakeholders to identify and address any issues related to the project. A Public Information Centre (PIC) will be held on Wednesday, June 2, 2011 from 5 p.m. to 9 p.m. at the Four Points Sheraton Hotel, 1926 Lake Shore Boulevard West to provide the community with an opportunity to learn more about the project. At the PIC residents and business owners will have the opportunity to learn more about the project, provide their input, and talk to Hydro One staff about any issues or concerns.